Dating to the first quarter of the nineteenth century, this fabulous Argand hall lantern was restored and finally installed in May, 2017 by machinist Joel Paradis of Westmoreland, New York. Joel fabricated the missing center fixture and patinated the frame with highlights to match as was done in the period. With the addition of this over-sized lantern, which is perfect for the generous proportions of the Entrance Hall, the mansion now boasts a variety of functioning period lighting devices that will be used for evening tours and demonstrations. 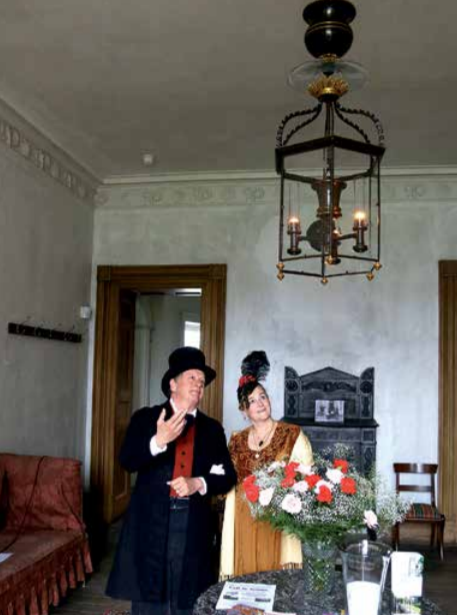 The lantern is a gift from Douglas R. Kent, who made funds available to support its purchase and full restoration. The lantern’s name is derived from Aime Argand, a Swiss-French chemist who devised a center draft burner in 1783 that represented the first major technological innovation in improved lighting since the time of the Romans. Although not original to Hyde Hall, it is an important early light fixture typical of the oversized lanterns often found in the halls of English and American mansions. We thank Doug and all our donors who have made it possible for us to add to our collection of furnishings and working period lighting.